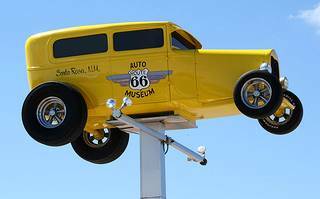 Full information on each of the sights, attractions and landmarks that are located along the U.S. Route 66. 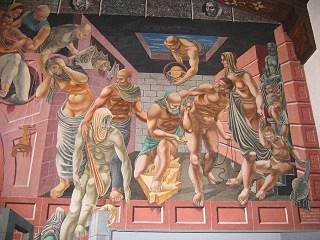 See the State-by-State, landmark-by-landmark list below and click on the links for full details. 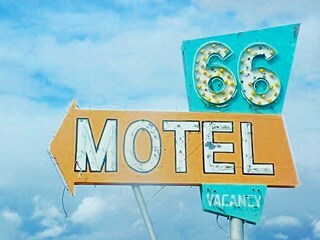 Route 66 has an amazing variety of landmarks of all types: natural scenery, classic vintage motels, gas stations and historic sites, this page lists many of them so that you can plan the Road Trip of your Life. States are listed alphabetically. Towns from East to West within each state. 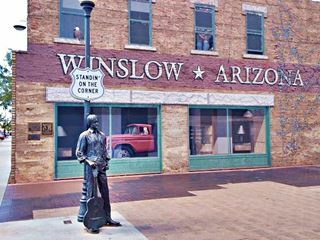 Click on the towns linked below for a full and detailed information on each landmark, classic US 66 attraction and marker in Arizona. 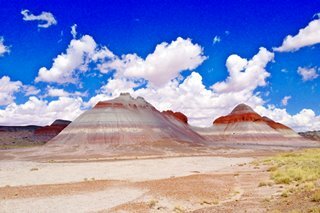 From meteor craters (in Barringer) to meteor fields (in Holbrook), from amazing National Parks and Monuments (Petrified Forest and Grand Canyon) to ghost towns, Arizona has a wide variety of landmarks apart from the classic ones (motels, diners, cafes, bridges and original road alignments). 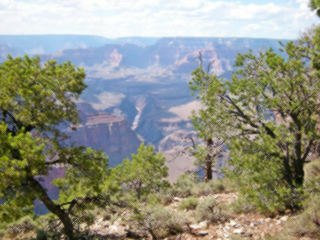 Grand Canyon National Park (from Williams or Flagstaff). 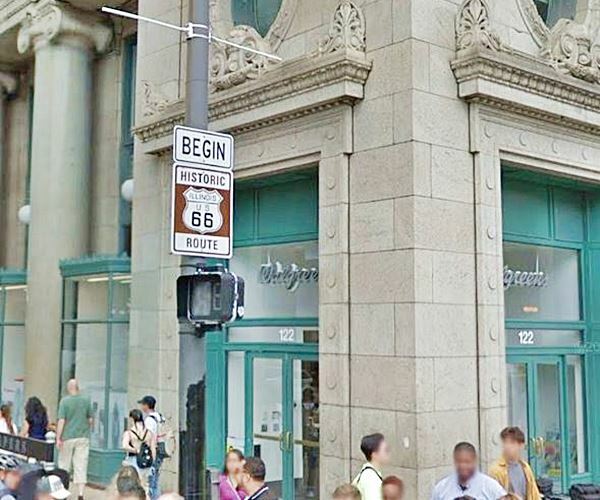 Route 66 "Begin" sign, Chicago. 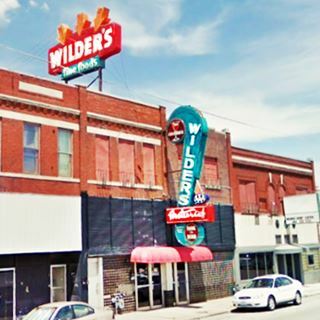 Classic buildings of an early 1900s Midwestern American city's Main Street which is the original 1926 alignment of Route 66. 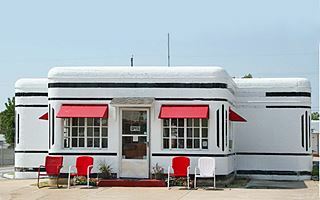 Another remarkable landmark in town is the Kan-O-Tex Service Station & Diner. 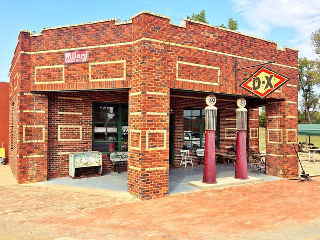 The service station dates back to 1934. 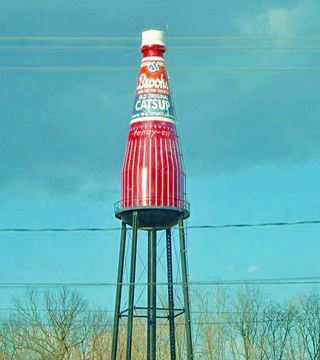 It sold a regional brand of gasoline in the states of Kansas, Oklahoma and Texas, and this gave it its name: Kan-O-Tex. The brand's logo was a sunflower set behind a five-pointed star. The company is now defunct. 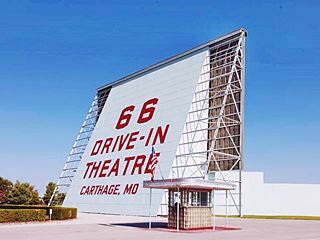 It was previously known as "Little's Service Station, "4 Women on the Route and now "Cars on the Route", due to the boom truck that inspired a character in the movie Cars. 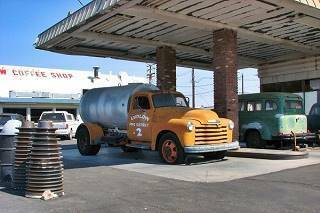 "Tow Mater", the tow truck in Pixar's movie "Cars", was inspired by a truck that can be seen at the service station. 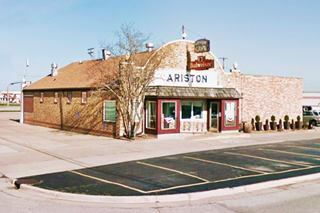 7109 SE Highway 66, Riverton, KS. 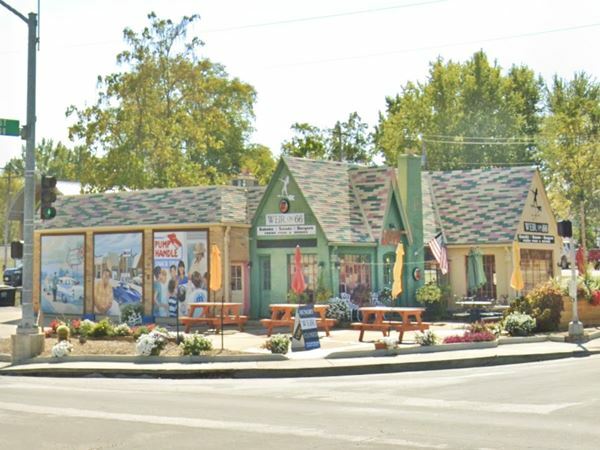 The oldest continuously operating store on Route 66: Open since 1925. 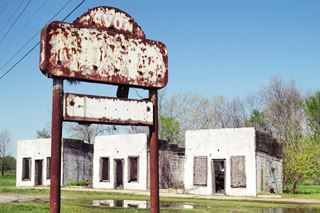 "Williams' Store" was established by Leo Williams in 1923, destroyed by a tornado and rebuilt in 1925; he, and then his wife ran the store until 1970. 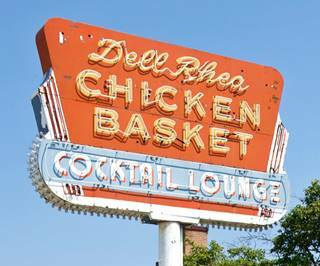 It was acquired by Isabell and Joe Eisler in 1973 and is now managed and owned by their nephew. 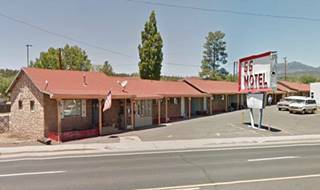 It is now the "Eisler Bros Old Riverton Store". 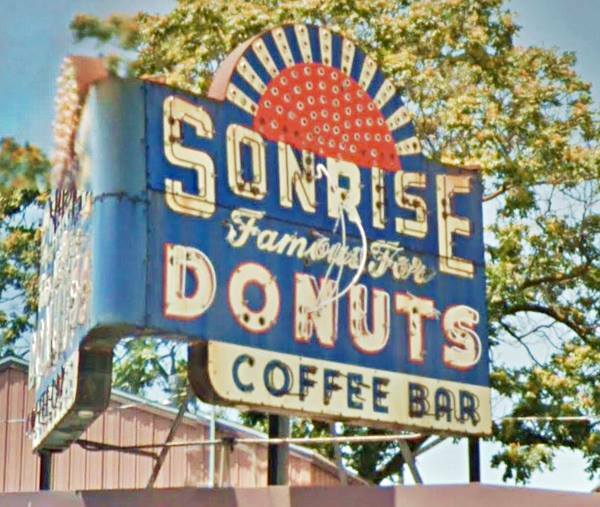 Enjoy its virtually unchanged ambiance, with a glass-enclosed porch, pressed-tin ceiling and old shelves. 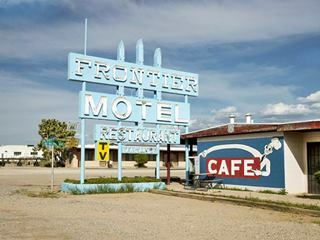 It sells groceries and Route 66 souvenirs. 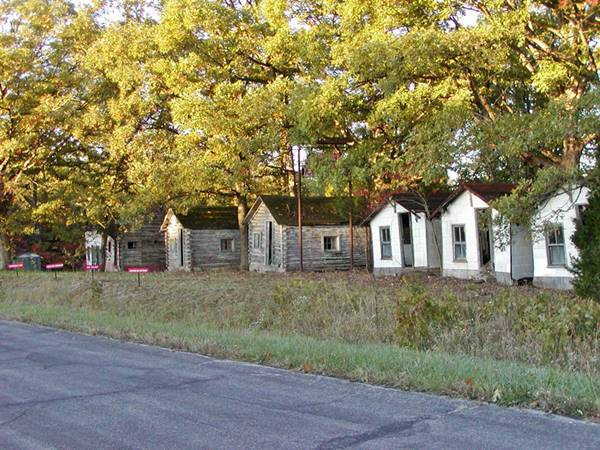 Old Route 66, Riverton, KS. Original Route 66 concrete arch bridge built in 1923, also known as the "Rainbow Bridge". 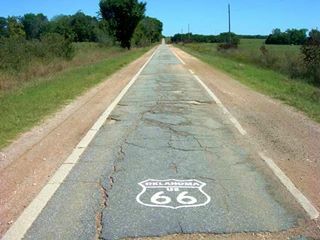 The concrete road would become part of Route 66 in 1926. It is a an elegant bridge, with two concrete arches. 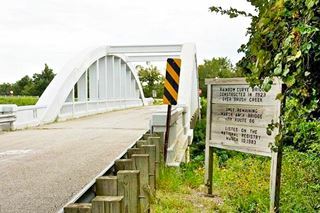 It is 130 feet (40 m) long and is the only surviving bridge of its kind in Kansas. 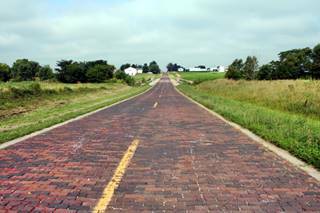 It was repaired in 2005 and is no longer open for traffic, but you can still walk across it. 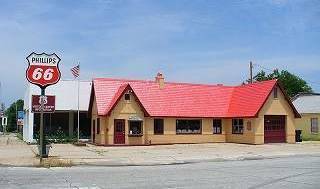 940 Military Avenue - Highway 66, Baxter Springs, KS. 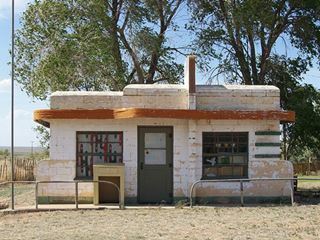 This service station is an example of the 1930s "cotttage" styl typical of the major oil companies during the Great Depression. 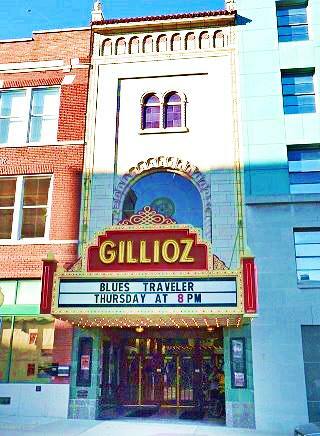 The building was enlarged in 1940, but its style was preserved. 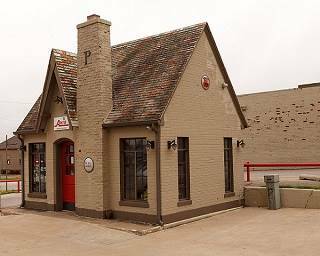 Originally part of the Independent Oil and Gas Co., it was acquired in 1930 by Phillips Petroleum. The main features of the "cottage style" were a pitched and gabled roof, brick and stucco walls, neat windows and a chimney. 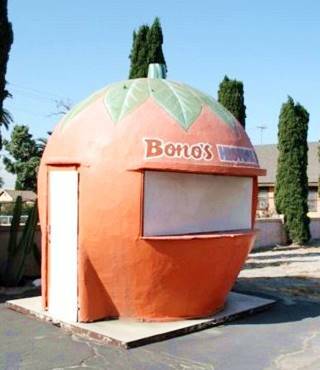 Notice the bay window by the entrance. 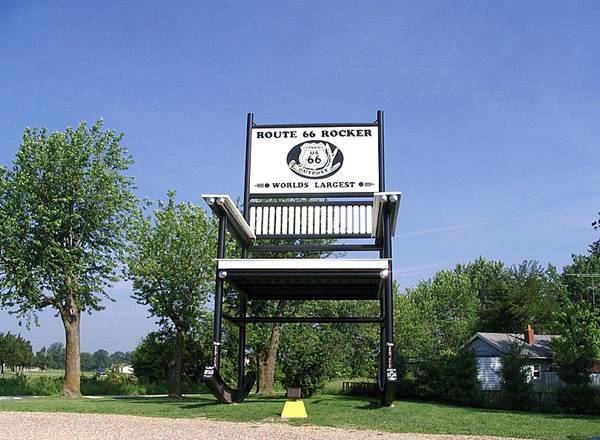 View of the former "World’s largest rocking chair", Route 66 in Fanning, Missouri (now it is painted red). 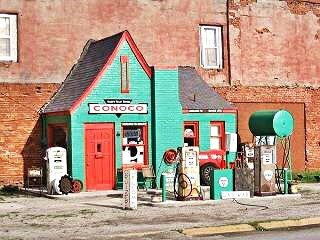 View of the Phillips 66 Gas station in Cuba Missouri. 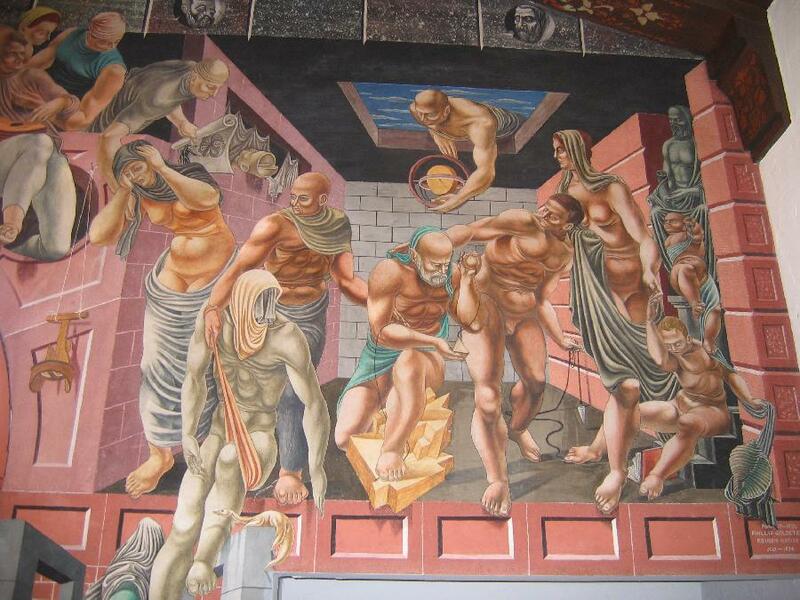 The Mural panels are on the far left. 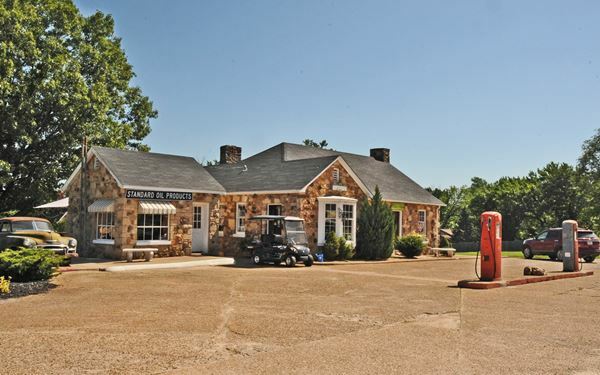 Check out RV and Motorhome Parks & Campgrounds in Missouri. 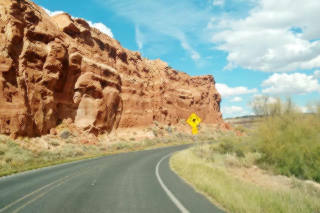 There are many more landmarks, just check the towns above. 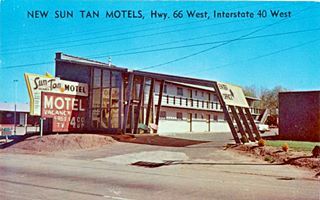 Click below to find out more about the different types of US 66 Landmark in each town on the Oklahoma section of the Mother road. 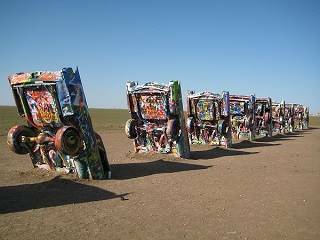 Click below for the landmarks in each city, town and village in Texas' Route 66. 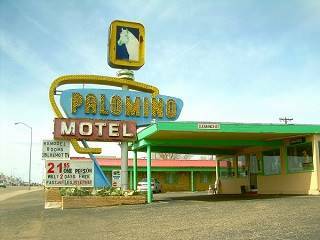 Click to read more about their monuments and markers and also the classic vintage Route 66 motels and gas stations. 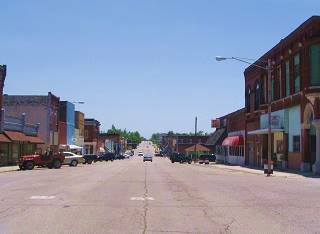 A town by town list of the top 10 TX landmarks along US 66. 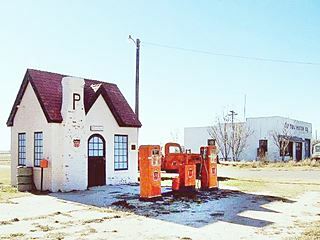 Route 66 reached McLean in 1927 and shortly after Phillips Petroleum chose the town as the location of its first gasoline station in Texas, which stands to this day. 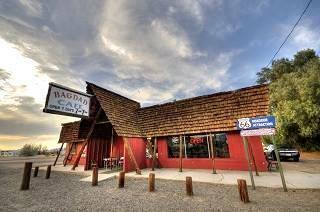 The building is surprisingly small for modern travelers, it was built in Tudor Revival style (which imitated medieval English cottages with simple lines, steep pitched roofs, tall windows, brickwork walls and high chimneys). 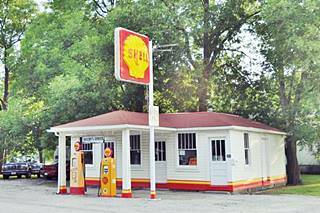 The service station closed in 1977 but has been restored to its original condition. 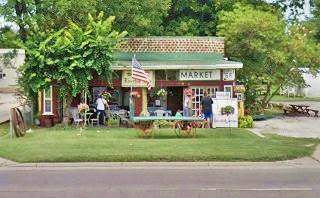 The gas stations were designed to blend in with the local neighborhoods, which were residential and that was the origin of the "cottage" look. 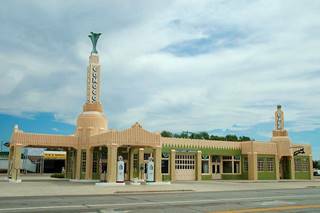 The company developed a high-octane gasoline in 1927 and ran a test drive along the brand new U.S. Highway 66. 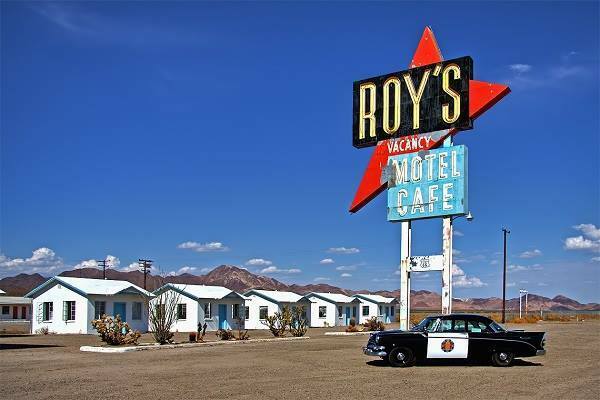 The car reached a cruising speed of 66 mph so inevitably the fuel was named Phillips 66®. The highway's shield shaped road sign inspired the company logo. 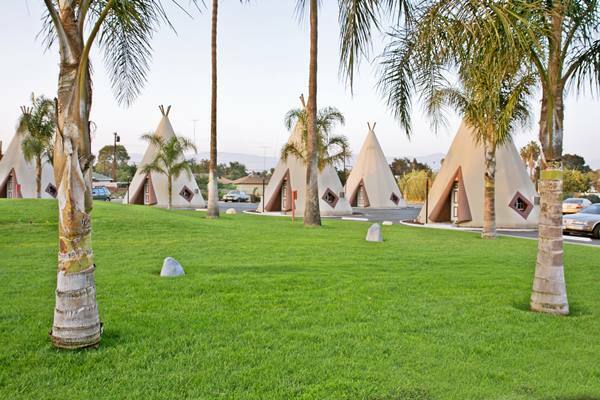 Check out RV and Motorhome Parks & Campgrounds in Texas.